I have a new writer to introduce to you today, a lovely lady who will be sharing lots of lovely recipes with us over the next few weeks and months. It’s Myriam Perez from Bizcocho Pastries. Myriam is a professional cake maker so will be bringing us lots of lovely recipe ideas with easy step by step instructions to follow. 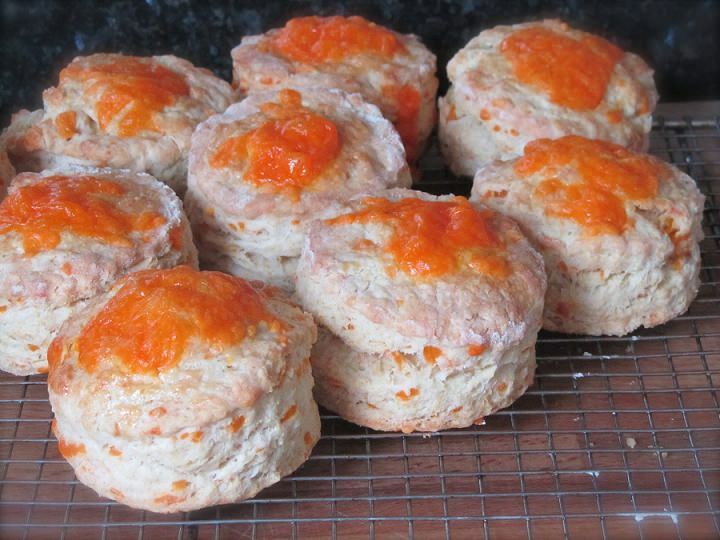 Today Myriam is sharing with us this tasty Cheese Scone recipe. 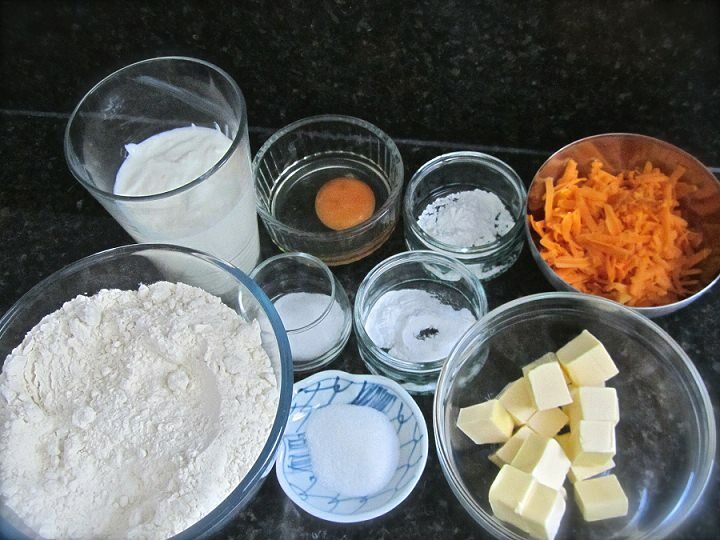 Makes 9 large scones (using a 3’’ cutter) or 15 small scones. STEP 1) Turn the oven on at 180C (electric), 160C (fan) and prepare a large baking sheet with parchment paper. STEP 2) Sieve the flour, baking powder, bicarbonate of soda, salt and sugar, then add the cold butter. At this point I like to put the bowl in the fridge for 15-20 minutes to get all the ingredients as cold as possible (optional). STEP 3) Rub the butter in the sieved ingredients with a pastry cutter or the tips of your fingers until large crumbs are achieved. 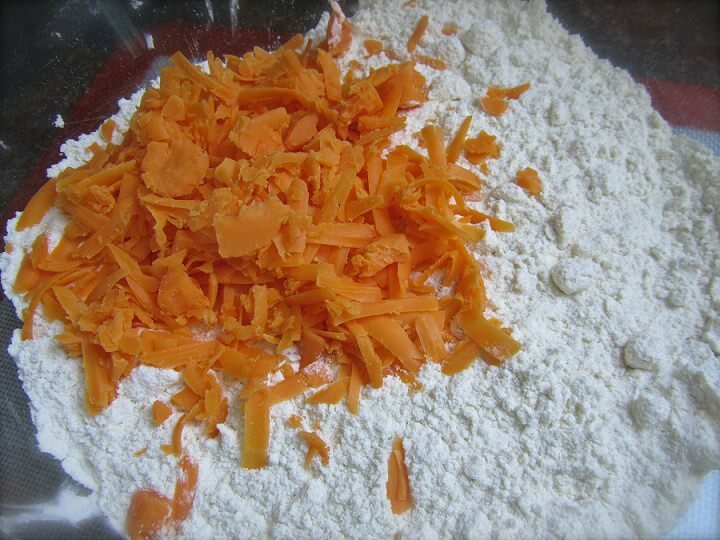 STEP 4) Add ¾ of the grated cheese and reserve the rest, make sure it is well mixed. 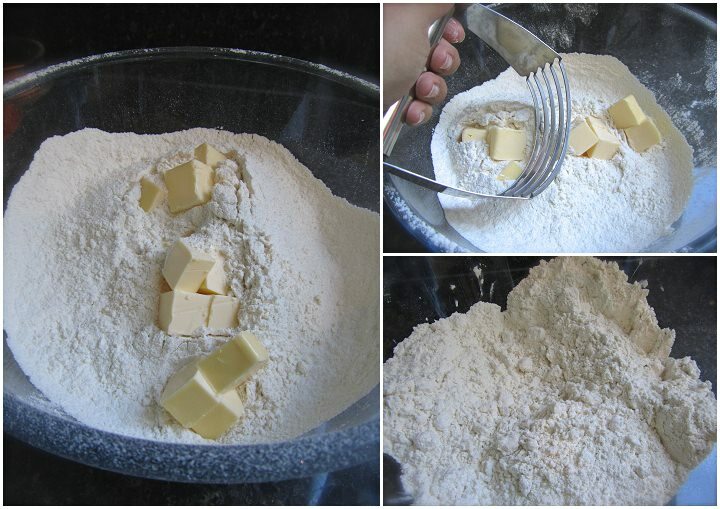 STEP 5) Add ¾ of the buttermilk and fold with a spatula, finally add the remaining buttermilk and incorporate. 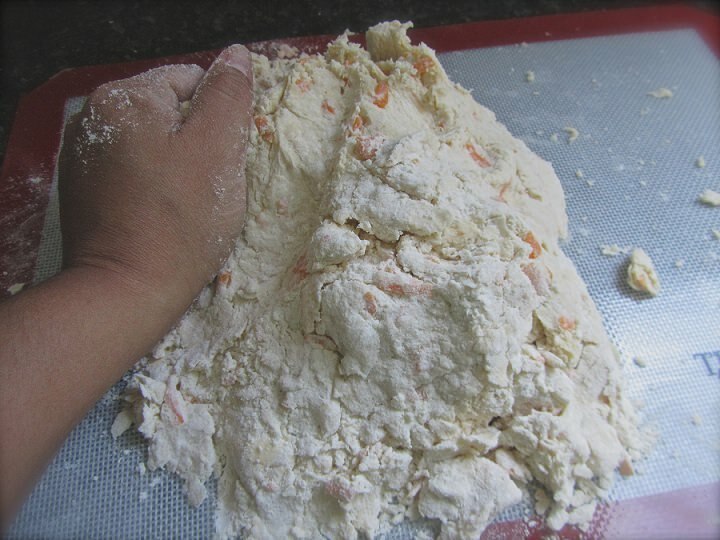 STEP 6) Tip the dough on a table and mix it together with your fingers. 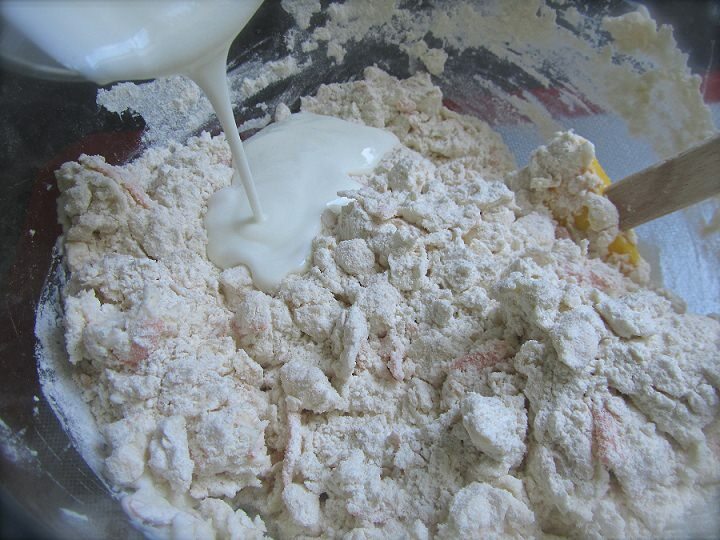 The mix will look dry but just keep working it until it comes together and the flour is fully incorporated. STEP 7) Make folding motions to incorporate all the dough together, this also builds up the layers that will make the scones light and flaky. STEP 8) Once the ingredients have come together, the dough will look smooth. 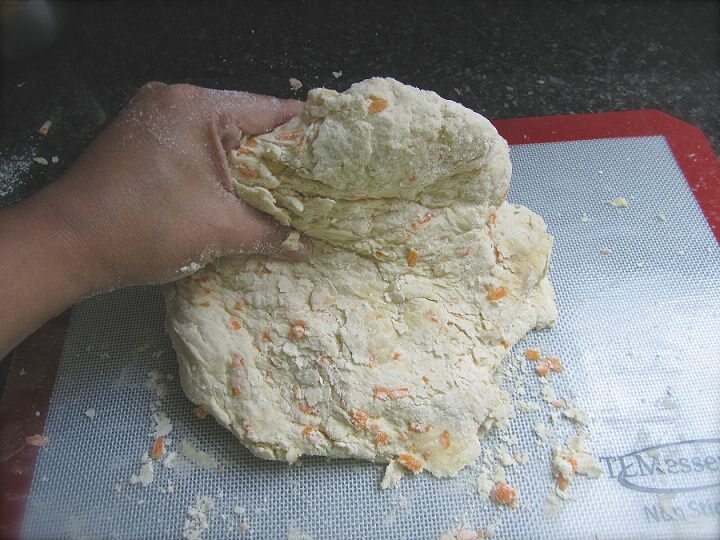 Spread the dough on the table pressing with the palm of your hand (you can also use a rolling pin if you wish). STEP 9) Use a floured round cutter (3’’) to cut out the scones. 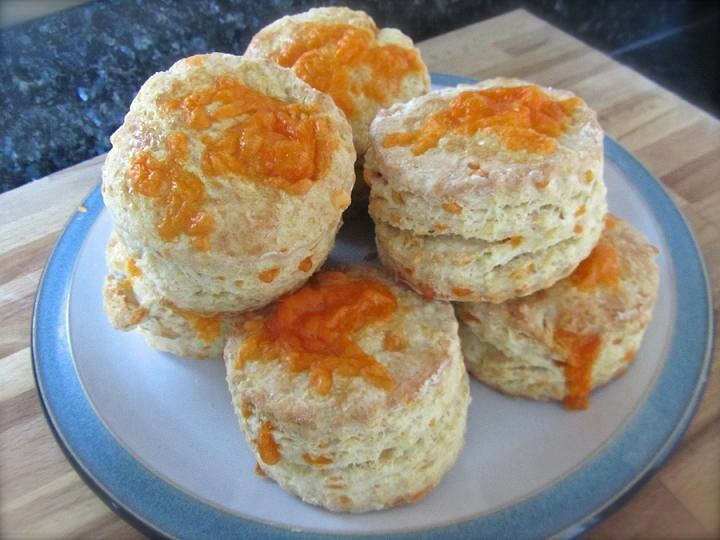 Bring together the remaining dough and cut out the rest of the scones. 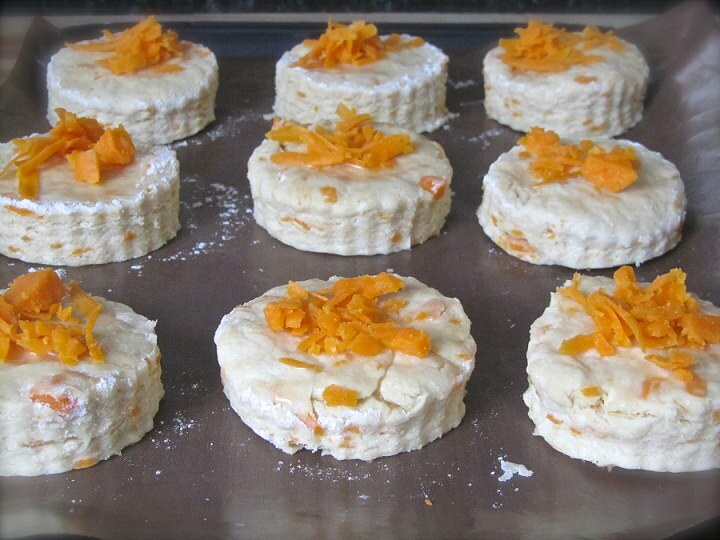 STEP 10) Transfer the scones to the baking sheet, brush with the beaten egg and top with the remaining grated cheese. STEP 11) Bake the scones for 15 minutes until the top is golden (turn the sheet half way through baking to promote even browning). STEP 12) Transfer the scones to a wired sheet and let them cool down for 30 minutes before eating. And you’re finished, these are a great accompaniment with soups, salads or as a snack.